A sumptuous array of gourmet delicacies erupts from this elegant wood and metal tray leaving nothing to the imagination. Gather everyone to share in this delicious feast! This gorgeous gift includes: Ghirardelli Masterpiece fine chocolate collection, Napa Valley mini mustard, Monterey Jack cheese, olives, Nunes Farms almonds, Bellagio hot chocolate, sourdough crackers, Epicurean cookies, Dolcetto pastry cookies, classic wafer cookies, Jer�s caramel squares, salted caramel chocolate chip cookies, Ghirardelli milk & caramel bar, hot fudge brownie, butter toffee pretzels, sugar cookies, cookie brittle, Ghirardelli assorted chocolate squares, honey cinnamon almonds, California hard fruit candies, flatbread crackers, Biscoff cookies, California wine wafers, cheese straws and Jo�s S�mores. Truly a party to remember! 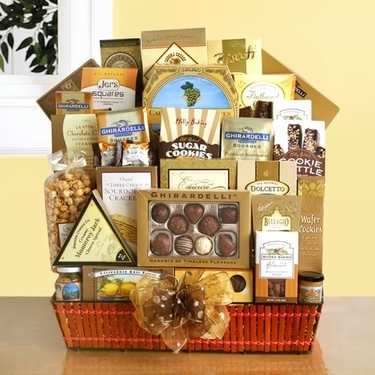 This Gift Basket Comes With Free Ground Shipping!